The restaurant was not that big but it has a spacious layout. 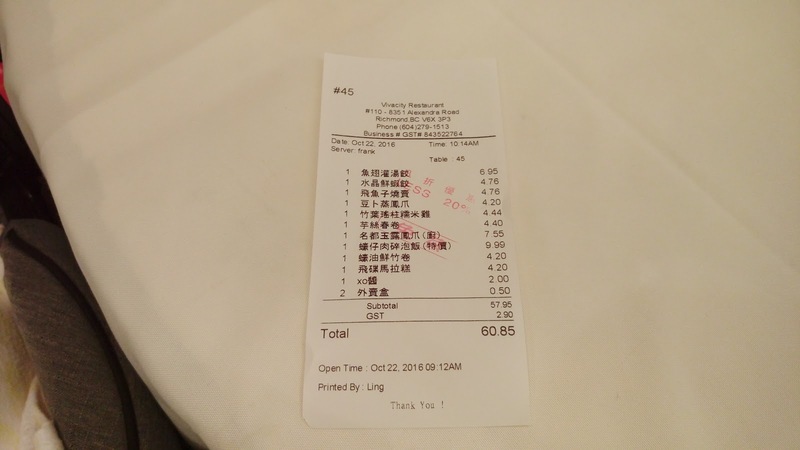 We simply could not stand those dim sum restaurants trying to jam pack as many tables as possible just to make that few extra dollars. We were a bit confused. 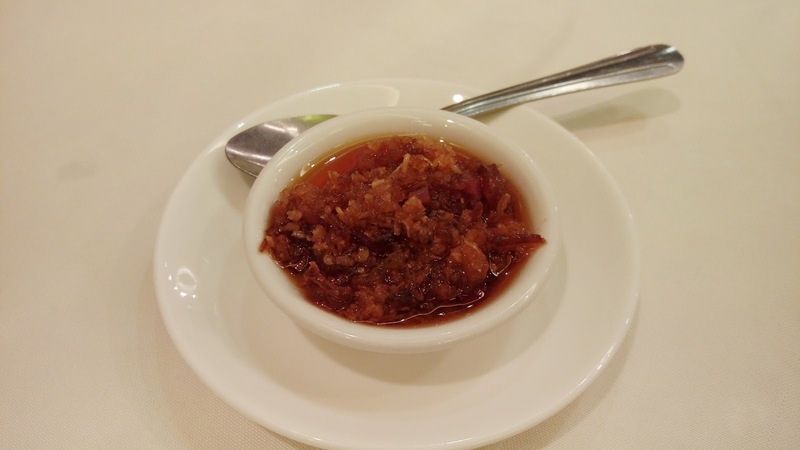 We were ready to pay $2.00CAD for the XO Sauce XO醬 but when the server dropped this off, he told us it's complimentary because this was a smaller portion. However, in the end, we were still changed a toonie for it. Huh? Anyhow, the sauce had the fundamental ingredients of dried shrimps, dried scallops, garlic and, of course, chili. It had a spicy kick but did not have much fragrance of dried scallops. The taste was predominately from dried shrimps. Garlic taste was detectable but minimal. 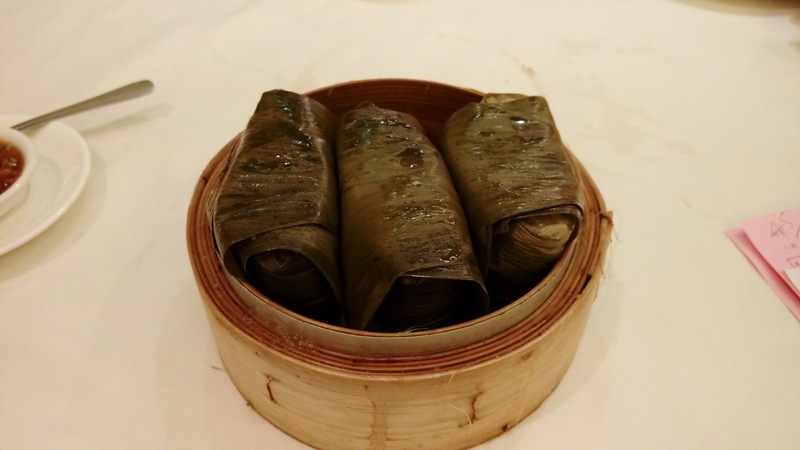 First came the Steamed Sticky Rice w/Lotus Leaf 竹葉瑤拄珍珠雞. 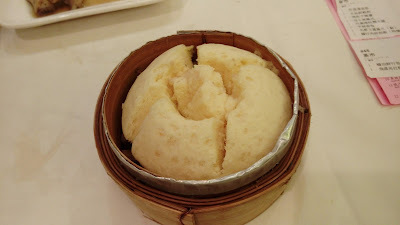 The glutinous rice itself was bland. 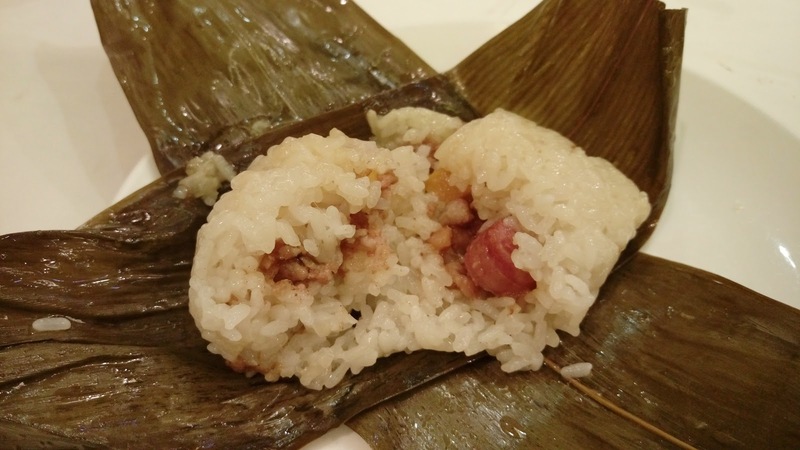 The filling had a good chunk of Chinese sausage but not much other elements. 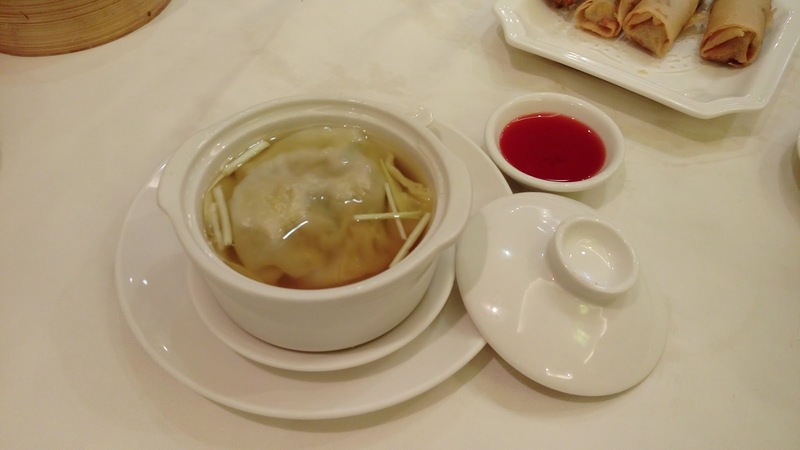 The Steamed Pork Dumpling 飛魚子燒賣 had a good balance of pork meat and pork fat. The shrimp used in the mix was overly soft. The stuffing was under-seasoned. 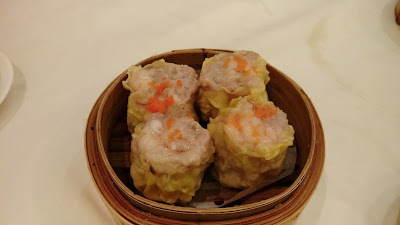 In contrast to the previous dish, the shrimp used in the Steamed Shrimp Dumpling 水晶鮮蝦餃 had a nice crunch. The translucent wrap was quite springy. The shrimp mix was also a bit under-seasoned. 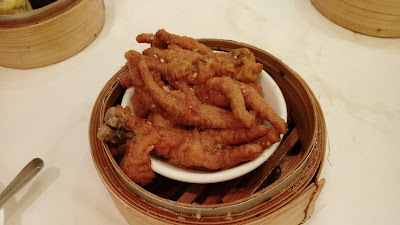 The Steamed Chicken Feet w/Deep Fried Bean Curd 豆卜蒸鳳爪 was a disappointment. While the claws were nicely fried and steamed, the sauce used was overly sweet and lacked that savory dimensions. The broth of the Seafood Dumpling w/Shark Fin in Soup 魚翅灌湯餃 was bland. 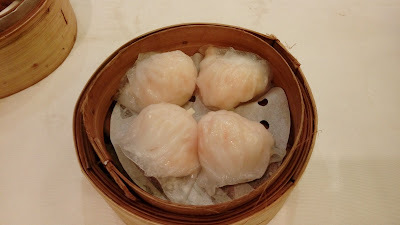 The stuffed dumpling had the common factors of shitake mushrooms, ham, scallop and shrimp. The "shark fin" was so little that it was almost unnoticeable. 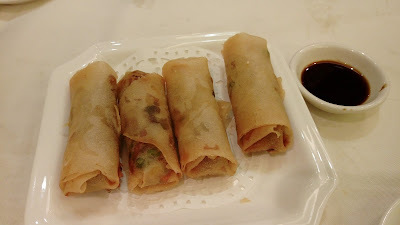 The Deep Fried Spring Rolls 芋絲春卷 was a fail. Why did the rolls tasted as the frying oil was bad? Didn't the restaurant just opened for business? I love kencur. Therefore, without a doubt, the order of Chicken Feet on Special Sauce 名都玉露鳳爪 was my favorite dish of the visit. The claws were blanched/steamed first then tossed in a delightful sand ginger mix. 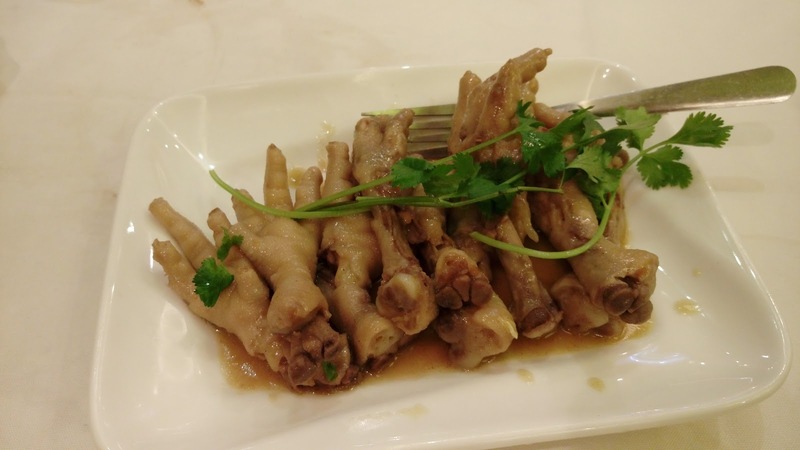 While I did enjoy the dish (and I polished 80% of it), these chicken feet needed to be cooked a lot longer to reach that desirable gelatinous texture. 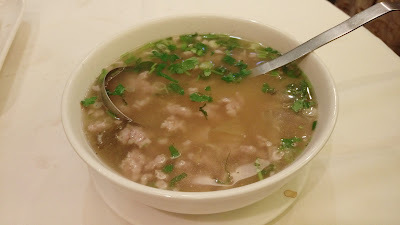 The Oyster & Minced Pork with Rice in Soup 蠔仔肉碎泡飯 took forever. 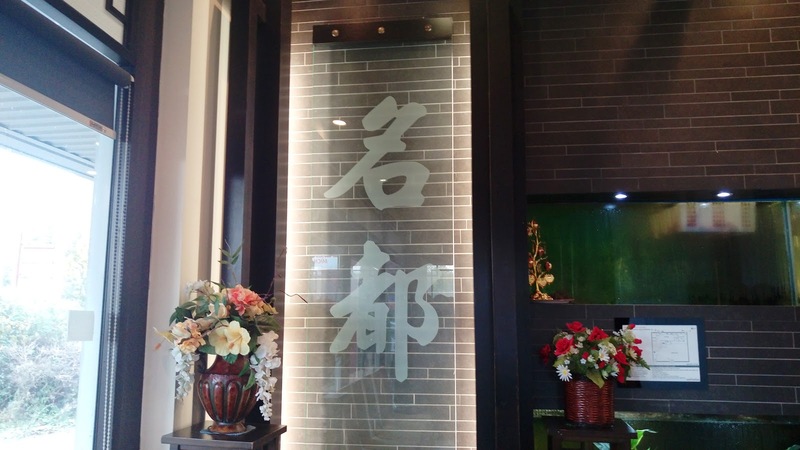 I had to inquire about its status numerous times. The bowl did not show up until I requested to cancel the order. Yup, funny how it always work that way. 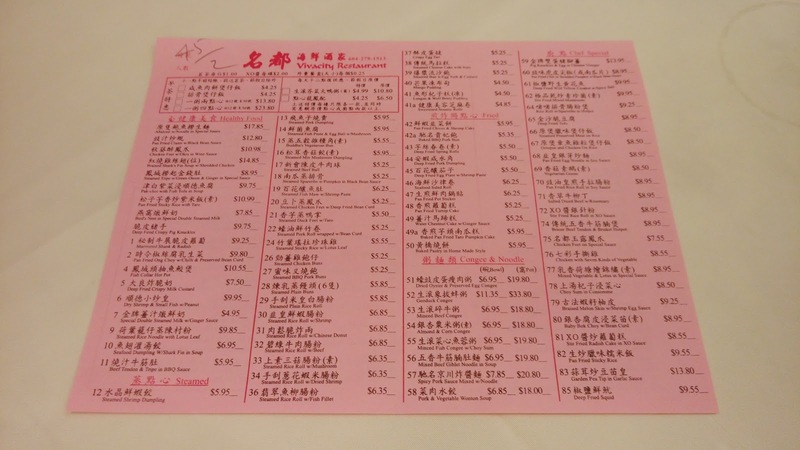 This had visible amount of minced pork with very, and I repeat, very, limited amount of chopped oysters. The soup was dull and boring, it was simply a bowl of lightly salted water with rice, cilantro and meat. The Steamed Pork Roll Wrapped w/Bean Curd 蠔油鮮竹卷 was an enjoyable dish. 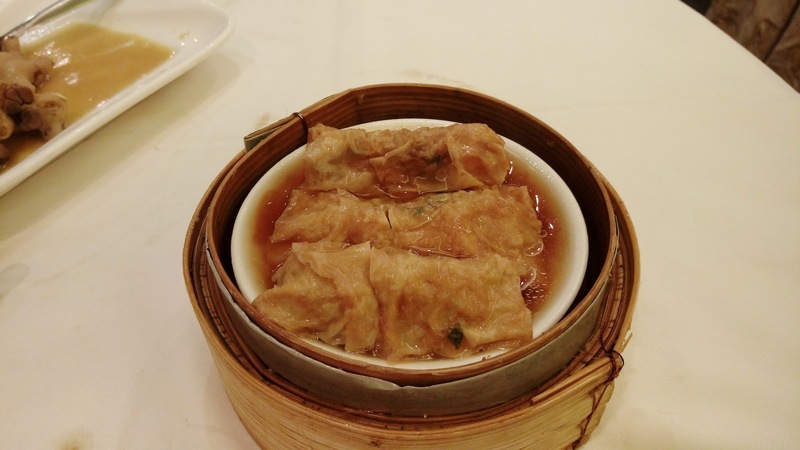 The rolls had thin layers of tofu skins that firmly wrapped generous portions of softly seasoned pork mix. This was one of the two dishes that were appetizing. I was not too impressed with the Steamed Chinese Cake With Nuts 傳統馬拉糕 (飛碟馬拉糕). Not only it was dry, it was also dense. That classic spongy texture was nowhere to be seen. Honestly, service was acceptable but food delivery was unorganized. 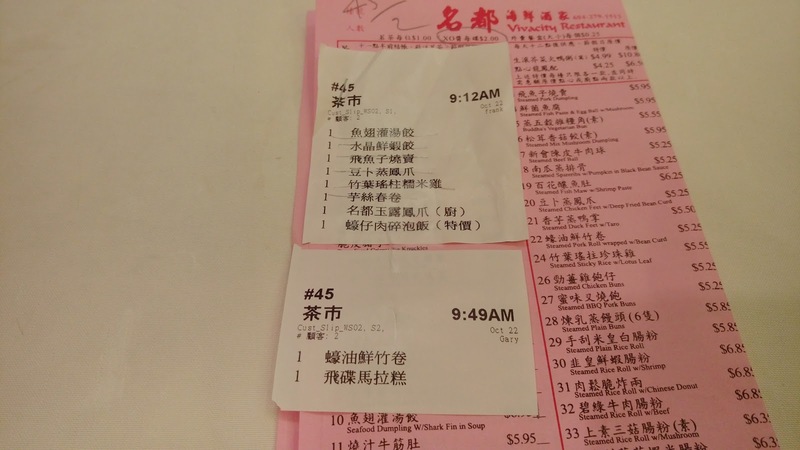 The kitchen was too focused on getting all the "morning tea special" congee calls out of the way that it conveniently forgot there were other requests too. Buddha Boy and I noticed that majority of the diners were seniors. Hmmm...could it be because of the 20% discount? 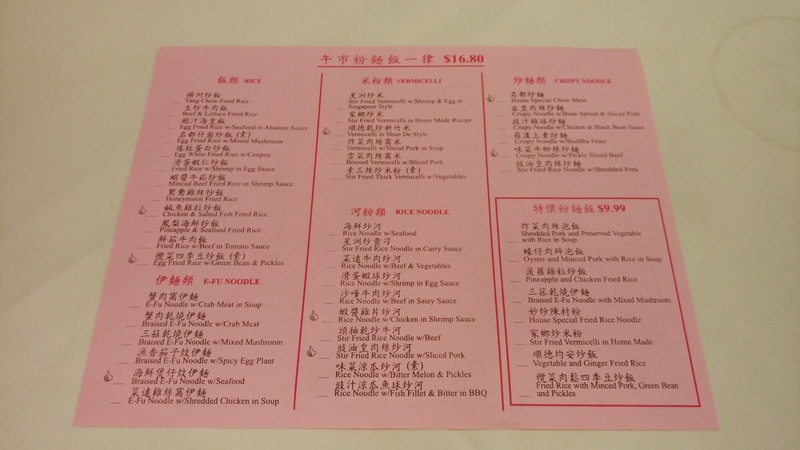 The "morning tea special"? The free tea? Or the flavorless low-sodium food? Been there. Done that. Not for us.